Sat., Oct. 1, 2016, 7:45 p.m.
SEATTLE – As eccentric as Marshawn Lynch might have been off the field, he was one of the Seahawks’ steadiest presences on it from the day he arrived in October 2010 until suffering his first major injury midway through last season. If you didn’t know what might happen when he stepped in front of a microphone, you knew exactly what would happen when he walked between the lines – 18-20 carries and 75-85 yards, his averages in every full season he played from 2011-14. But life without Lynch has become strange in its own unexpected ways for the Seahawks, whose post-Lynch plan has shown that, well, the best-laid plans don’t always go according to plan. In other words, Seattle probably didn’t think a few months ago it would be in need of signing two free-agent running backs off the street in the first four weeks of the season, the latest being former first-round draft pick C.J. Spiller, who is likely to see time for the Seahawks Sunday against the New York Jets. What Seattle had planned for life after Lynch seemed solid enough –depend on Thomas Rawls to recover from his ankle injury and Christine Michael to continue the career revival that began late last season while supplementing the position with three rookies taken in the 2016 draft. It all seemed to be going well enough that for most of the offseason, the biggest question about Seattle’s running-back corps was whether there would be enough carries to go around. But through the first quarter of the season, that’s been little problem with Rawls and third-round pick C.J. Prosise hit with injuries, and fifth-round pick Alex Collins still finding his way and relegated to reserve duty. That’s left Michael – traded away 13 months ago and regarded then as one of the biggest draft disappointments of the John Schneider/Pete Carroll era – in the unlikely role of being Seattle’s Mr. Dependable. Rawls, meanwhile, is out “a few more weeks,’’ as Carroll said Monday, a development that helped lead to the signing this week of Spiller, after Seattle last week brought in Terrence Magee to round out the tailback corps against the 49ers. Magee added to what has been a lengthening list of journeymen to spend at least a game on the active roster since Lynch’s injury at midseason last year that effectively marked the beginning of the end of his Seattle tenure. Remember DuJuan Harris’ 18 carries last year against Baltimore after Rawls was injured and Bryce Brown scoring a touchdown in the regular-season finale last year at Arizona? 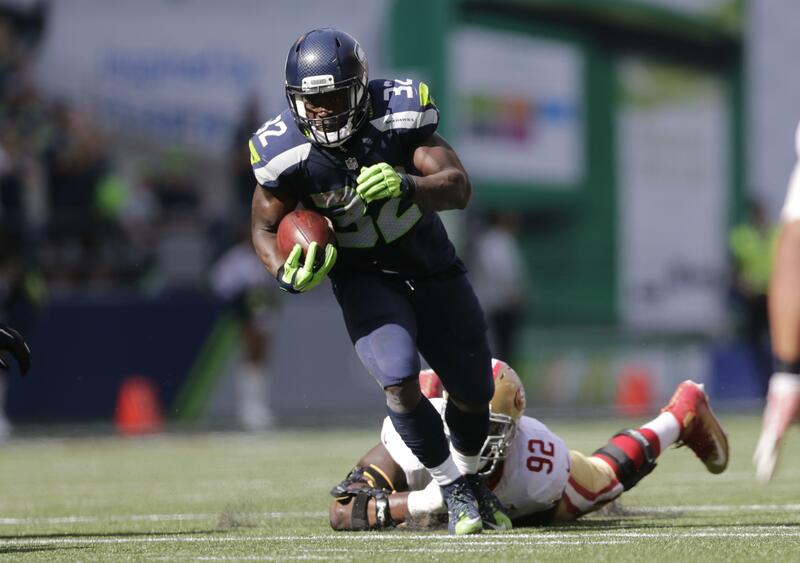 Consider that from 2011-14, only two Seattle tailbacks had 10 or more carries in a game – Lynch and Robert Turbin. Seattle has had five do that since the midway point of last season – Lynch, Rawls, Michael, Brown and Harris. Running backs coach Sherman Smith, who basically didn’t have to bother drawing up a depth chart for most of the past five years, now finds himself wondering weekly who will be where. The uncertainty isn’t just about the present, though. As an undrafted rookie free agent, Rawls is on a three-year deal through 2017. The Seahawks could extend him after the 2016 season, which a month or two ago might have seemed a desired course. But depending on how well he comes back from his latest injury and performs the rest of the year, the team might want to wait to see how 2017 unfolds before taking that plunge. Michael, meanwhile, is on a one-year contract and Seattle suddenly might have more of a decision than it figured in whether, and how heavily, to invest in him for the future – while Michael, assuming the season continues the way it has, might want to test the market (though the good news there for Seattle is that running-back market seems to be increasingly team-friendly). And while there’s obviously still a long ways to go, neither Prosise nor Collins have yet shown exactly where they will fit in long term. For a team whose offensive identity will always be heavily predicated around its ground game, an awful lot seems to still be up in the air about how life after Lynch will unfold. Published: Oct. 1, 2016, 7:45 p.m.